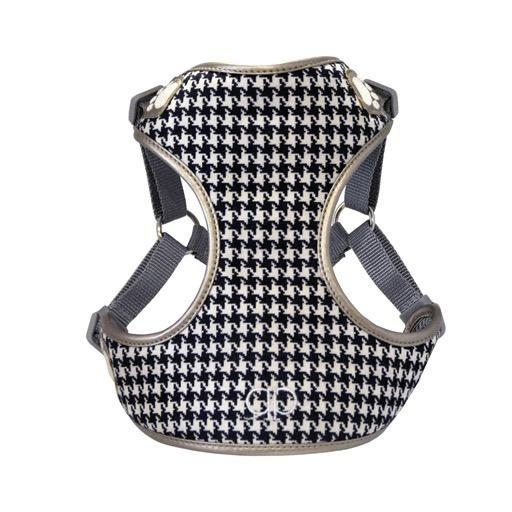 The London Buckingham harness is composed of the classic Houndstooth pattern, which is also known as a dogstooth textile characterized by\ broken checks or abstract four-pointed shapes, often in black and white. This particular design was made popular by the Prince of England, hence the name “Buckingham”, which is the Royal palace located in London. To emulate a majestic, regal presence, the piece is composed of velvety, plush, luxurious fabric and accented with a polished bronze leatherette ribbing that is highlighted with creamy pearl embroidery. The Houndstooth term has been dated back from 1936 and was referred to as dogstooth while the smaller version of this print is known as puppy’s tooth in deep association with dogs.